Catchfire Creative is a small (but mighty!) agency, so any new face that pops up is noticed right away – both by our team and by our clients. 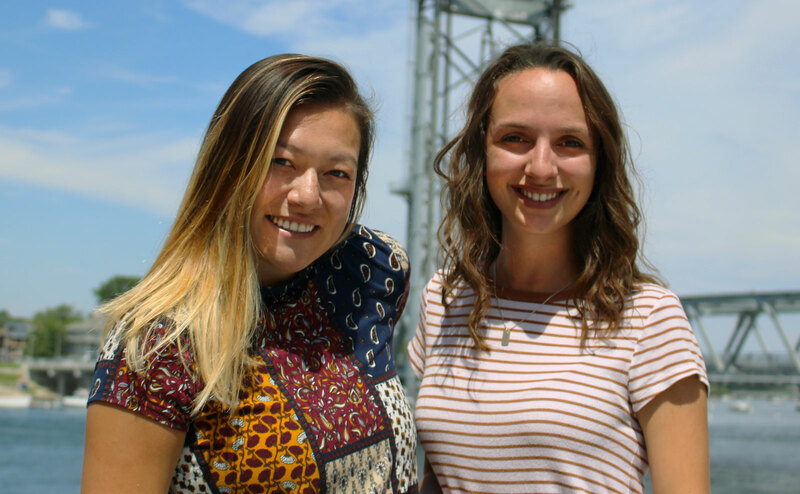 For that reason, we wanted to introduce the world to our two new team members, Gloria Bibbo and Meghan Lien. Gloria was our content marketing intern throughout the winter and spring, during which she impressed us with her endless enthusiasm, lightning-fast ability to learn new things, and natural fit with our team. Meghan recently joined us as a digital marketing intern and we’re already feeling lucky to have her. Already a seasoned professional in Portsmouth’s restaurant scene, Meghan’s goal is to get some agency experience at Catchfire. We’re already putting her appetite for social media to good use researching what’s happening at the wild frontier of social selling. But enough from us – we’ll let you get to know our two new team members in their own words! I graduated from UNH this spring with a dual major in Spanish and Communication: Business Application. Throughout high school and college, I took many art classes and have always stayed very connected to my creative side by painting, throwing pottery, snapping pictures, or doodling in class. During my time at UNH, I also studied abroad in Granada, Spain and Costa Rica, which totally gave me the travel bug so I drove across the country last month, hitting 20 states. Now I’m at 38 states visited! Why work at a creative agency in NH? I love working in a creative agency because I am constantly surrounded by inspiration and talent. The environment at work is full of music, photoshoots, social trends, and gifs and for me that is the perfect petri dish for creation and happiness. Being in NH makes it even better because of all the same aspects and the added element of nature. Leaving work feeling inspired just to drive past the ocean and mountains is the perfect mix. To top it off Portsmouth has an awesome slew of local farm to table restaurants and a swinging music scene. It’s basically perfect! Part of your job you’d do even if no one paid you? Participate in creative, mind melding brainstorm sessions. I could do that all day, everyday! I absolutely love watching small ideas grow strong and powerful as we all feed into someone’s thought. We come up with some pretty cool things around here and I love how much it gets my mind going. Best thing about being at Catchfire so far? Best part about being at Catchfire so far is easily the fact that there is an adorable dog here daily. Dolce is a weirdo but she keeps the office lighthearted and always keeps us laughing. Which do you prefer – digital or print? Print! Like a typical wannabe hipster-ish millennial, I’m all about the retro and so I love the tangible element of print. I love that you can then use interesting quotes or photography in awesome multimedia collages. I do work at a digital agency though so there will always be a huge place in my heart for the endless opportunities that the digital world offers! Lately I’m really into Nixie One; we use it here at Catchfire all the time and I love that it is sort of a mix between the classic type print and a more modern shape. Which social platform are you most often glued to? Instagram! I love the little visual snapshots of people’s lives. Stories have been such a fun way to get a peek into user’s actual lives, too, not just the curated pretty version, and I love that contrast. And now I can save posts in collections? It’s got everything! Millennial pink or a heart of black? Send it! Spontaneity has always served me well, it brings me on endless adventures and is the reason I swim in the ocean even when it’s cold. I don’t overthink it, I just send it! What’s the best thing you pass on the way to Catchfire’s office? Wagon Hill Farm. I love seeing it change as the seasons pass, in the summer it’s green and blooming, fall brings the foliage and then in the winter it’s full of sled tracks from local kids. It’s a homey place, and the big wagon is cool and vintage looking. Hospitality and restaurant management. I’ve worked in various positions in the local and Boston industry for about 7 years. Regardless of my title, I’ve always been lucky enough to add a bit of creativity to my position with social media marketing and content creation. New Hampshire, particularly the seacoast, is so organically inspiring that it gives the best backdrop to work and create in. Nothing beats walking into work, seeing the memorial bridge, and smelling the ocean air. Brainstorming and developing social media content. I’m constantly doing it already for myself, for friends, or to help out awesome local businesses. I love the challenge of creating something that is relatable for large audiences. Joining the team without agency experience, it’s been so inspiring working with so many creatives that have talent all across the board. I’ve always got an ear listening in on conversations about web design and management. I learn something new every day! Digital. It’s so accessible and doesn’t always have to be so polished. Everything moves so fast, it’s a challenge to get your message across which calls for the context to be funny, eye catching, or very relevant. That being said, I’ll never make the switch from a paperback to a kindle at the beach. American typewriter. I love the simplicity, clean lines, and for me, it’s a nod to history in the digital age. I have an obsessive and consuming relationship with Instagram. I love being outside and documenting all the beautiful oceans, cities, and mountains I visit. If I’m not posting my own photos, I’m gawking at travel photos from places I’ve never been to… or puppies. I’m such a heart of black, I had to google millennial pink. Yes. My family and friends always come to me first with an idea or plan knowing I will fully support and participate in it. I’m a Sagittarius and a younger sibling and I definitely resemble those personality traits. I’m a bit reckless and very adventurous. Portsmouth. I love living in the center of our big little town. If I’m running early, I’ll walk through Strawbery Banke and look at the historic homes and if I’m running late, walking right through the middle of town serves me best to grab a coffee on the go and catch a glimpse of everyone’s favorite steeple at North Church! Think working at Catchfire Creative sounds like a little slice of heaven? (Full disclosure: it definitely is.) Keep an eye on us to see when we’re hiring. We’re a bit selective about who joins our rad band of storytellers, but we’re always excited to hear from people with the kind of experience in website development, graphic design, or inbound marketing that will drive results for our ever-expanding roster of clients. Are you our next superstar like Gloria or Meghan?